27 September 1917 Sanctuary Wood in the Ypres sector, Belgium. Showing the smoke just clearing after the burst of an enemy shell. The son of George and Annie Alliss, Charles Alliss was born at Wainfleet, Lincolnshire in 1884. The Census of 1891 records the family (George and Annie and their two sons George and Charles) was living at Breeder Hills, Sedgebrook Road, Barrowby. George Alliss was a blacksmith and an traction engine driver. Charles married Emily Hutchinson from nearby village of Knipton in 1905. By 1911 they were living in Bottesford at Muston Gorse Farm employed as a farm labourer. They had two children – Charles Frederick (born 1907) and Hilda May (born 1909). Charles Alliss’s death during the 3rd Battle of Ypres would bereave Emily and four young children including Kathleen ( born 1911) and George (born 1914). There are no detailed service records for Charles Alliss. However Medal Rolls show that he served with three separate Battalions of the Yorkshire Regiment – the 5th (service number 8000; the 4th (service number 8000) and then finally with the 8th (service number 203184). This would indicate that he moved to the 8th Battalion some time after 1st March 1917 when all service numbers were updated to an army wide system of 6 digit numbers. Up to that date each battalion had had its own number system. 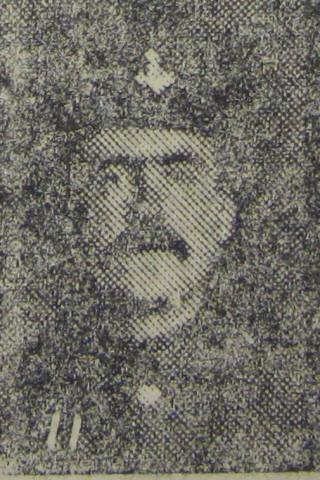 What records there are also indicate that he joined up in Middlesbrough ( see UK Soldiers Died in the Great War 1914-1919). 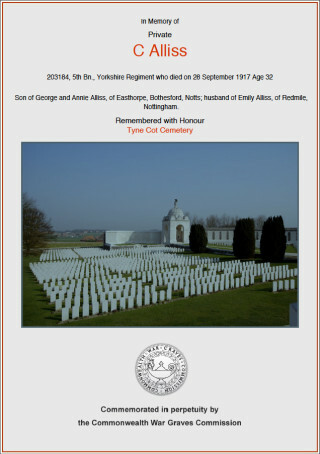 We have no information as to why he would have enlisted in Middlesbrough other than the the 4th and 5th Battalions of the Yorkshire Regiment were based up in Northumberland. The 4th and 5th Battalions served in the same theatres of action throughout the 1st World War. Apparently transfers of men between the battalions was common place. (See Bill Danby’s web pages on the 1/4th and 1/5th Battalions of the Yorkshire Regiment ). We can glean more information from the War Diaries of the 8th Battalion. 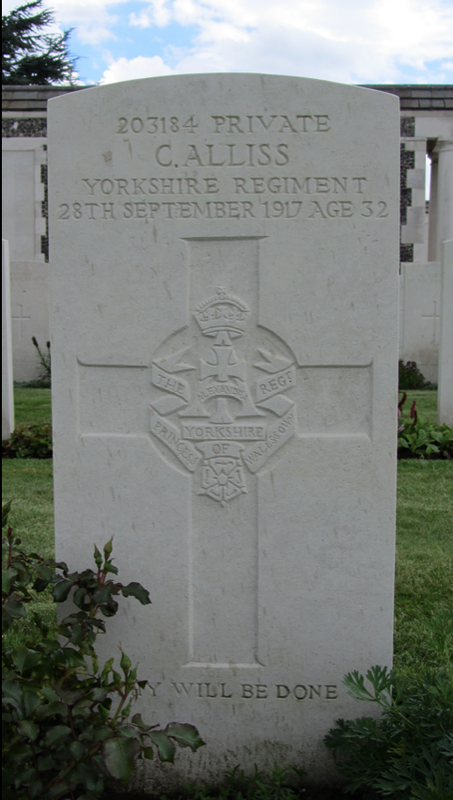 As part of the 23rd Division, 69th Brigade the 8th Battalion, The Yorkshire Regiment was deployed in the 3rd Battle of Ypres. This was an attempt by allied forces to break out from the confines of the Ypres salient between 31st July to 11 November 1917. The 2nd and Fifth Armies made up of British, ANZAC and Canadian forces, fought a series of battles culminating in the Battle of Passchendaele. Charles Alliss served with his Battalion in both the Battle of Menin Road, 20-25th September and after only very brief respite in the Battle of Polygon Wood, 26th September- 3rd October 1917. It is possible to work out from the Battalion War Diaries that Charles Alliss served with ‘C Company’ of the 8th Battalion. C Company was a support Company on the date of his death on 28th September 1917. This was the only company of the 8th Battalion to suffer fatalities on that day due to German shell fire. On 20th September as part of the 69th Brigade they attacked Inverness Copse at 5.45 am. C Company, including Charles Alliss, moved up to act as a reserve. They then moved at 6.30 a.m. on the 21st September to relieve B & C Coys. of the 10th Duke of Wellington Regiment. They were then relieved by the Sherwood Foresters on at 9.30 p.m. on the 22th before moving to Sanctuary Wood. C company was then itself relieved from action by the Suffolk Regt. on the morning of the 24th September. Their respite in camp was short lived. On the 27th the Battalion left Alberta Camp and proceeded to Scottish Wood by bus. At 2.30 p.m. they marched back to Sanctuary Wood. A, B and D Coys and took front line positions with C Coy in support south of Black Watch Corner. The next day saw the support company came under ‘very heavy shell fire and suffered casualties.’ Charles Alliss was one of those killed. 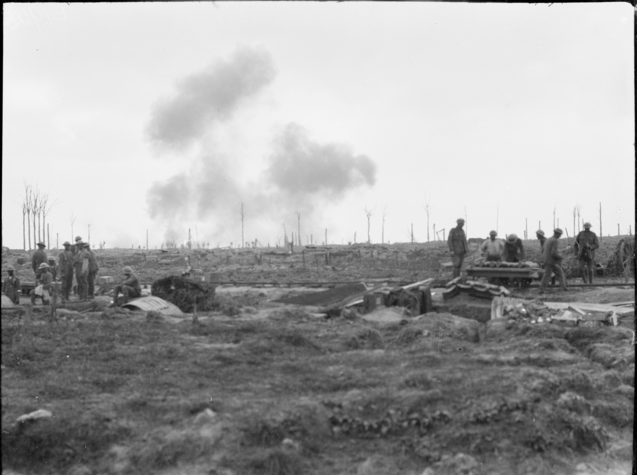 The shelling continued the next day and on the 30th September the Battalion was relieved by the 9th Yorkshire Battalion. The War Diary for that lists 1 officer and 100 Other ranks – ‘203184 Pte. 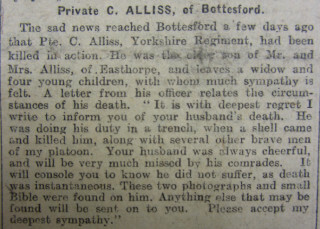 C. Alliss is remembered by name in his Battalion’s War Diary. 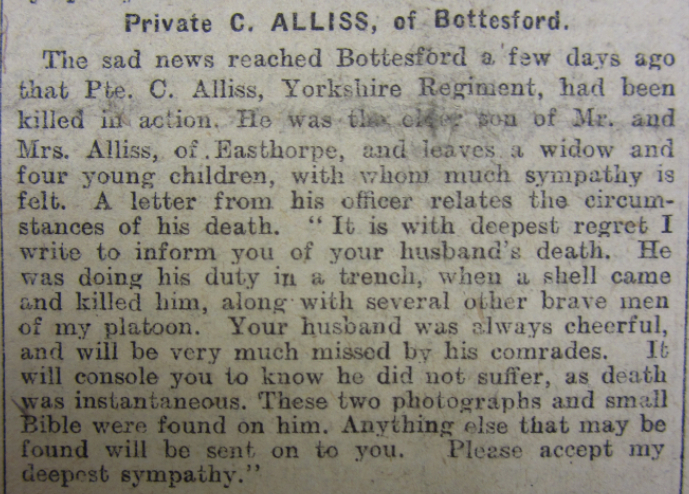 The sad news of his loss had already reached his family in Bottesford and been reported in The Grantham Journal on the 20th October. Charles Alliss’s body was recovered. He is one of 11962 service men killed in Battles of Ypres with a known grave who are buried at Tyne Cot Cemetery.